Say the word "Maggi", and like Pavlov's dogs my mouth starts watering for the brick of instant noodles wrapped in bright yellow plastic that my mum would keep on the hardest-to-reach shelves of our pantry. It was, and still is, impossible to resist the beloved noodles that cook in as little as two minutes. In India, Maggi is the more heavily spiced answer to regular ramen, delivering the same satisfying tangle of chewy noodles but swapping a milder seasoning packet for one with a lot more punch. It was one of my favourite after-school snacks, something a distracted teenager could whip up while simultaneously texting friends about our crushes, watching MTV and supposedly doing calculus homework. To this day, it's one of my favourite meals to eat when I'm under the weather. Some people crave chicken noodle soup, but I reach for the sinus-clearing and life-affirming package of masala Maggi. The instant noodles have become so entwined in the Indian mealtime lexicon, even after a five-month recall and lead crisis in 2015, they are used as the base for everything from omelets to pizza. Say the word "Maggi" to Andrea Nguyen, and it elicits a similar, visceral, nostalgic response but for a completely different product. For Nguyen, a Vietnamese writer, cook and the author of Vietnamese Food Any Day, Maggi means a small, brown glass bottle with a square bottom and slender neck filled with an inky seasoning sauce. "It is transformative to many foods but is really part of the flavour profile of banh mi," she notes. "You can't quite get real banh mi without Maggi." For Mexican-American chef Wesley Avila in Los Angeles, Maggi also denotes a beloved seasoning sauce that gives stews and meat an extra oomph. But the version Avila loves is Jugo Maggi, more syrupy and milder than its Vietnamese counterpart. For Washington-based chef Kwame Onwuachi, Maggi was also a staple in his kitchen growing up when making Nigerian and Jamaican dishes. Except, if you say "Maggi" to Onwuachi, it means one thing only: foil-wrapped bouillon cubes that took such dishes as jollof rice and hearty soups to new, umami-packed heights. Shayma Saadat, a Pakistani-Afghani cook and food writer who lives in Toronto, also has fond memories of the bouillon cubes she would pick up from South Asian grocery stores to give daals and yakhni, a deeply flavourful broth used to make rice dishes, a meaty infusion of flavour. But Maggi for Saadat also means tall glass bottles filled with a zippy chile garlic sauce. "I always keep a bottle in my fridge," Saadat says. Peek into homes and restaurants in China, Poland, the Philippines, France and Australia, and you'll probably find Maggi products - most often a seasoning sauce, bouillon cube, noodle or soup mix - on one of the shelves. The seasoning sauce Maggi Wüeze, which is reminiscent of the flavour of the lovage plant, has become so popular and beloved in Germany that Germans often colloquially referent to lovage as "maggikraut". Like salt, fat, acid and heat, Maggi is one of the few great unifiers of the world's kitchens and may be Switzerland's largest and most influential culinary contribution. Today, the Maggi empire - one of Nestle's billion-dollar brands - sells more than 7000 products across 98 countries. In 1886, the Swiss government asked Julius Maggi, a miller, to create a food product that would be easy and quick to make but would be nutritious and affordable for the working-class population. Meat was expensive, and only the wealthy could afford to make it part of their regular diets. So Maggi created three instant soups - two made from peas and one made from beans. Shortly after, Maggi invented his namesake seasoning, a dark, concentrated sauce made from hydrolysed vegetable protein. The result made soups, consommes and other foods taste meaty without animal protein. Maggi continued to innovate - at one point creating mock-turtle flavoured soup and even a truffle-flavored Maggi seasoning sauce - and they became an instant success, spreading to Germany, France and Britain by 1888. Thanks to such forces as immigration, colonisation and trade deals, the products also quickly became popular in countries across Asia and Africa. 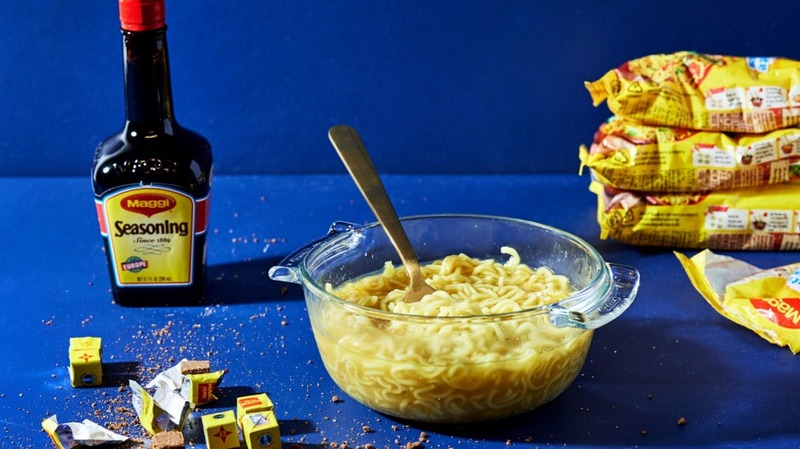 "Maggi products were first imported into China as early as the 1930s," says Nelson Pena, president of baking and global foods at Nestle USA, Maggi's parent company. Maggi eventually brought a China-specific blend to market in 1994. Today, the French version of Maggi is still highly revered in Vietnam, Nguyen says. "For cooking, you use the Chinese version," she says. "If you really want to impress people, you whip out the French version. It's more expensive." 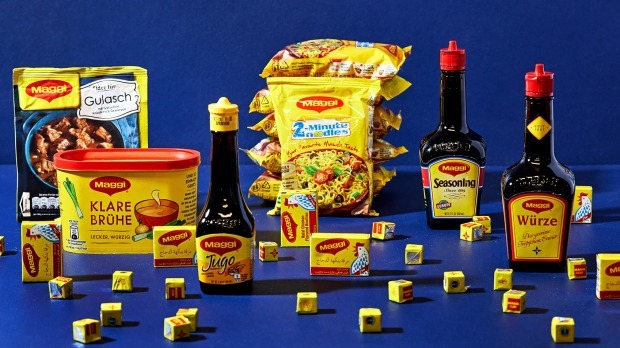 Maggi continued to expand its product line, first introducing noodles to Malaysia in the 1970s, before it eventually gained extreme popularity in India and decent market share in such places as South Africa, Ukraine and New Zealand, Pena says. Today, the Maggi empire - one of Nestle's billion-dollar brands - sells more than 7000 products across 98 countries. All of them remain extremely affordable. The Maggi expansion hasn't been without hiccups, particularly in India. In 2015, after government tests there showed elevated levels of lead (along with MSG, which is legal in India but requires a warning label that wasn't on the packages), Indian consumers were so incensed they burned the noodles in the streets, along with photos of celebrity Maggi endorsers. The crisis went on for months, with India eventually banning Maggi products nationwide and Nestle - while insisting that the government tests were wrong - recalling the products, incinerating more than 30,000 tonnes of them. Later that year, after Nestle sued, India's High Court lifted the ban, allowing the company to resume sales if the products passed extensive tests, which they did. By the following spring, Maggi was at the top of India's noodle business again, with 50 per cent market share. Even though the products that Maggi sells in each market are very different, they have become integral to the cuisines of many countries. Nguyen, Avila, Onwuachi and Saadat agreed that Maggi seasoning sauces and bouillon cubes give food this umami je ne sais quoi. No one could quite describe what the taste of Maggi was, but they could definitely tell if it was missing from a dish. The flavour is so necessary that Avila and Onwuachi, both chefs who have cooked in fine-dining kitchens, insist on using Maggi at their restaurants. At Guerrilla Tacos in Los Angeles, Avila uses Jugo Maggi in a marinade for his pork char xui tacos. You can also find it in the quesadilla, where maitake mushrooms are tossed with Jugo Maggi, soy sauce, garlic and ginger. He also avidly cooks with it at home, noting that it is one of the secret weapons in his carne asada. Onwuachi takes his commitment to Maggi to new heights at his Washington restaurant Kith and Kin. "I import cubes of Maggi from Nigeria," he says with a laugh. "We use it to make suya and other dishes. I need it for that traditional taste." The Maggi is so important to the kitchen, one prep cook has the pleasurable task of unwrapping hundreds of foil-wrapped bouillon cubes, one-by-one, before service. Maggi, like Coca-Cola, McDonald's and Starbucks, is adept at localisation, adapting products to fit the flavour palates of local markets. This helps to explain its global success. "Where possible, we optimise our sourcing and selectively source ingredients locally that drive authentic taste and flavour, like herbs and spices," notes Pena. On one hand, this is advantageous for local cooks (and curious Maggi collectors). On the other hand, it makes it difficult to substitute one Maggi product with a similar one from another country. Avila has tasted the Chinese version of Maggi seasoning sauce but much prefers the light flavour of Jugo Maggi. Nguyen insists the French version tastes more high-end than the Vietnamese version, which is closer to soy sauce. And Onwuachi will use only Maggi bouillon cubes from Nigeria for certain dishes and cubes from Jamaica for others. Saadat says that she once tried to use Maggi bouillon cubes purchased from a Canadian supermarket instead of a South Asian grocery store and found them to be completely lacking in flavour and nearly inedible. With such products as 2 Minute Cheese-flavored instant noodles and instant mushroom soups, Maggi surprisingly isn't a household name in the US. According to Pena, Maggi's biggest markets are Germany, India, Brazil, the Middle East and West Africa. Many Maggi products contain MSG, which naturally occurs in hydrolysed vegetable protein. And though MSG has been falsely maligned in headlines, there is no doubt that it adds a deep umami flavour to anything it touches. For now, acquiring a bottle or cube of Maggi usually requires wandering down the "international aisle" at a supermarket. If you're lucky, you might just find five different versions.